THE NEW PLANET - "XENA"!? The Leo Full Moon takes place on July 19 at 17:54 UT. I am that, and that I am. We are delighted to present an article on the discovery of the new planet (if, indeed, it is a planet) written especially for the full moon newsletter by the people at SouledOut.org. Could the planet be focusing the dual forces of Leo and Aquarius? Is it the one Alice Bailey wrote about? Time will tell. This artist's concept shows "Xena" at the lonely outer fringes of our solar system. is at least as big as Pluto and about three times farther away from the Sun than Pluto. It is very cold and dark. This is an amazing time, as we experience the recent announcement of yet another world orbiting around our solar center. From the standpoint of esoteric astrology, this new discovery auspiciously coincides with this year's Sirius Festival, at the Leo full moon August 19. With all the discussion of what constitutes a planet, it may be of use to consider what is referred to here, as "etheric planets"? Indeed, astronomy has debated off and on since the discovery of Pluto whether or not it is a planet. On the other hand, certainly astrologers are convinced Pluto is part of the horoscope and in the relatively short time since its discovery in 1930, it has taken on significance equal in importance to the other planets. Regardless of scientific debate about what constitutes a planet, and more importantly from the point of view of planetary lightworkers, we can focus on the quality of the new planet, as we welcome it to the body we recognize as our solar system. What, indeed, does it portend? Does this new planet have to do with etheric understanding? Bailey told us that people on the planet would see etherically by the end of last century, "Etheric matter is even now becoming visible to some, and will be entirely visible at the end of this century to many." (A Treatise on White Magic, p 374) We may take it for granted because devices are required to accomplish it, but one could certainly make a case that radio, television and computers all enable us to see that which is etheric, using light and sound waves. Now people are seeing etheric material without devices, as we witness in multiple reports. Will this etheric communication, seeing the inner planes, now become more widespread and recognized? Every dense physical planet has a planetary logos, a kumara, and a corresponding planetary entity, a being, utilizing the planet as its dense body of expression. Just as each of us influences each other, so too do each of the planets' beings influence each other as they participate together in the plan and purpose of our Solar Logos. During this Sirius Festival cycle, we have an opportunity to register impressions about the new planet and its place in our solar system. What is its note and sound? What is unique to our Earth's present time energies, to this time in world history, that is the reflection of this planet's, this being's quality? For the discoveries of Uranus, Neptune and Pluto, each of these represents qualities emblematic of the time they were revealed. For Uranus in 1781, the American and French Revolutions portended the spread of democracy and the call for freedom around the globe, and Ben Franklin discovered electricity. As for Neptune discovered in 1846, the railways and automated transit began to draw all parts of the world together on a grid. When Pluto was discovered in 1930, the world was in the midpoint of the two world wars and getting ready to unleash radioactive energy upon the planet. Never before did our current civilization have the capability to annihilate ourselves on such a large scale. Not all that long before the telescopic planets were discovered, people thought the earth was flat, that we were the center of the universe, that the sun revolved around the earth. Now physicists are imaging and seeing the elegant universe which theorizes we have a minimum of 11 dimensions - yet they exist side by side, actually interpenetrating each other - just as the human soul, as a vehicle of expression, has three bodies, seemingly one. This quote (from Bailey's discussion in Esoteric Astrology on Leo, published in 1951, after Pluto had been discovered and known about) relates to the Heart of the Sun (ruling planet of Leo), and the Leo~Aquarius axis, and thusly to the Sirius Festival. 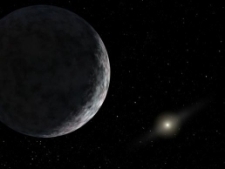 Is "Xena" this undiscovered planet? Does this new planet hook up to Sirius, as we know to pour forces into our planetary life during August? Then, what about the name, Xena? The modern day story of Xena took place in Greece, in the time of Hercules. Xena transformed from a "Warrior" warlord into a superheroine "Princess." Much as members of humanity, in turning the wheel from the mutable to the fixed cross, Xena set out to redeem herself. Is this not representative of the path of discipleship? And Xena was super-powerful. Not all-powerful by any means, yet she could move and manipulate in ways impossible to other mortals. She'd sound the trademark Xena war cry - her shrill attack woodpecker-y sound, and disarm many a foe. She was a super-person, an unexpected yet oddly appealing example for our time, who demonstrates the growth of the sacred feminine energy being observed in the world today. Whatever happens with the final choice, this name came through the team responsible for discovering 2003 UB313. Unlike any other major named heavenly body, this name comes from today's mythology, that expression of our own present time culture. Leo is also a time to remember the special Leo-Sirius relationship. Alice Bailey tells us in Esoteric Astrology that "August, which is ruled by Leo, is the month of the Dog-star, or of Sirius, which thus brings Sirius into close relation to Leo. Leo, in the cosmic sense (and apart from our solar system altogether) is ruled by Sirius. Sirius is the home of that greater Lodge to which our fifth initiation admits a man and to which it brings him, as a humble disciple. Later, when the new world religion is founded and is working, we shall find that the major, monthly festival in August, held at the time of the full moon, will be dedicated to the task of making contact, via the Hierarchy, with Sirian force". Click here for a suggested Global Meditation for the Sirius Festival.